The Destination & Travel Foundation (DTF) is complementary organization to the Destination Marketing Association International (DMAI), a professional organization representing destination marketing organizations and convention and visitor bureaus worldwide. Each year, DMAI organizes the Destinations Showcase event – North America’s largest one-day event exclusively bringing conference, convention, and trade show professionals together with exhibiting meeting destinations from around the world. By tradition, Destinations Showcase is immediately followed by the Destination & Travel Foundation’s Annual Gala, a fundraising event intended to support Foundation projects and programming. 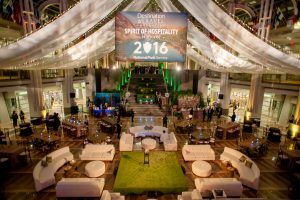 Rendezvous was honored to be selected to produce the 2016 Annual Gala, an event hosted at the Ronald Reagan International Trade Center celebrating the National Park Service as the Foundation’s 2016 Spirit of Hospitality Honoree. At the outset of our work with DTF we were presented with a challenge: help us transition the event from a seated dinner for 1000+ guests to a standing reception without impacting our ability to sell tickets or sponsorships – a challenge we are presented with more and more often as groups have come to recognize a growing trend in forgoing formal seated affairs in favor of informal networking events. Working hand in hand with DTF’s Executive Director, our event design process focused around the need to create “sellable moments” that addressed the goals and objectives of potential Gala sponsors while still allowing for a cohesive and enjoyable attendee experience. With approximately six months to bring the event to life, we began with in-depth discussions about past events, prospective sponsors, and available “real estate” – creating a roadmap that the fundraising team could use to “sell” the event while we continued the design process. From floor plans we moved to three-dimensional event renders, stopping at each step along the way to confirm that our design process was addressing all of the seemingly competing event priorities and stitching them together into one whole experience. With renders approved, we spent the final weeks just prior to the Gala focused on the many details that are always covered but often overlooked as key design elements: namebadges, event signage, linens, votives, floral, menu selections. 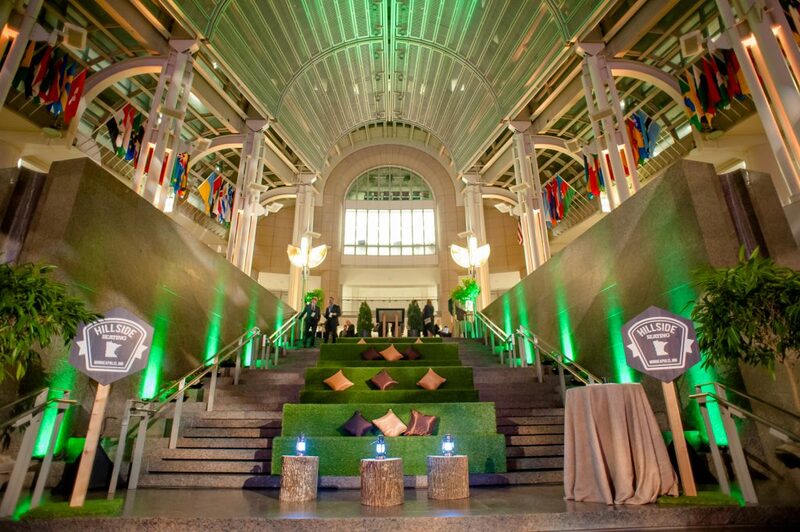 Nothing came into our Gala event site that didn’t support our design or our underlying event objectives – right down to the “hillside seating” we built into the Grand Staircase and the reclaimed tree stumps from a park site in Virginia we repurposed as end tables.